FRAME came about because Ken and Bonnie had been playing together in the group, Classical Tangent for several years, slipping in shows as a duo here and there. They have performed together in California, Washington State, Oregon and Massachusetts. 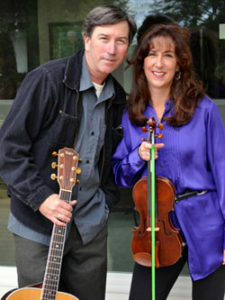 Their blended sound combines Ken’s folk rock expertise and Bonnie’s Celtic and classical background. This new album “Consider the Source” plays on themes of each coast, growing up, and meeting in the middle. It was recorded at the Grammy winning studio “Soundmirror” in Boston. Ken Bewick is a guitarist, recording artist, and songwriter based in Santa Cruz, California, writing, playing and performing for more than 25 years. Along with guitar and vocals, Ken also plays trumpet, bass, drums and percussion and his interest in music spans all genres and eras. He has played and performed on his own, most recently producing 2 CDs as “Bottle of Sound” and as support for many artists, including T-Bone Burnett, Cowboy Junkies, Seals and Crofts, Sam Phillips, Hot Tuna, and Leon Russell. He has scored and produced music for live dance ensemble, film, and commercial audio projects. He is married to the beautiful and talented Cynthia Strauss Bewick, and their daughter, Elena, plays violin! 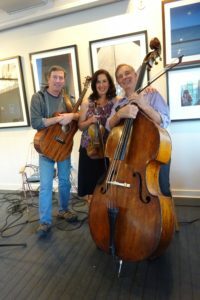 Bonnie has been a member of the of the Boston Symphony Orchestra for over 20 years, is an active performer and teacher and has been playing Celtic and folk fiddle for the last 10 years. She is a member of the group “Childsplay” and founded the world music group “Classical Tangent” with Ken and several Boston Symphony members. The crossover to folk music provides balance and a creative outlet, and playing with her brother is a dream come true. Bonnie can be found on several tracks of Ken’s recent “Bottle of Sound” CD, which gave them a hint of how much fun the duo could be. Bonnie is married to the wise and rock-solid Michael Brown and their sons, Andrew and Kevin, play guitar and violin! Ken firmly believes that creating good food is nearly as much fun as making good music, so he can often be found in his kitchen, tossing ingredients around with merry abandon. Ken has learned from some top-notch chefs and is a culinary force to be reckoned with. Bonnie is no slouch in the kitchen herself and their favorite way to decompress after playing is to cook together.